Russell works with our children, providing musical direction, during our children’s worship services held during our special Social Action Sundays. Each of these Sundays the children are working on a special project and our children’s worship theme centers on the chosen project. We recognize music as a special dimension of spirituality, and are pleased to have Russell’s talents reach most of our children this way. Each Sunday all of our children are part of the first ten minutes of our adult service. They participate each week in our opening words and hymn. We want them to be familiar with the music we all love – and to know the hymns we often sing. We frequently use our more popular hymns during our children’s worship as well. Several Sundays during the year all our children and youth attend intergenerational worship – to mark the special Sundays we all celebrate together. 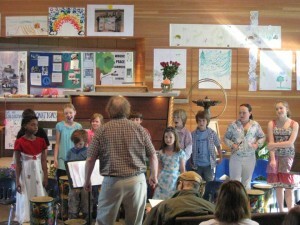 Northern Lights is a multi-aged Youth Choir. Students are engaged in developing vocal and instrumental skills of expression through singing world and local music and accompanying themselves on drum and the Irish tin whistle. They are encouraged and empowered by the congregations’ warm reception of their performance three times yearly. The fall or winter performance will be in collaboration with the Adult Choir to inspire greater achievement. Music is selected to support UU principals and expand global perspectives. Practice takes place between services on scheduled Sundays, enabling children from either service to participate. Students in grade 4 and older children have the option to learn the tin whistle and/or to accompany the choir with band or orchestral instruments they have learned outside of the choir period. Choir membership is open to grades 1-12. Kindergarten students are welcome to participate with parental involvement. Student in grades 9-12 are encouraged to continue participating in leadership roles. As with any group of children in the church, we require that two adults be present when our Children’s Choir practices. We are in need of assistants for Russell each week. On performance days we need parents to help the children practice, and watch them while they wait to perform. Sign up is available outside the peach room in the RE wing where practices take place. We ask that all families who have children in the choir assist some time during the church year. Registration forms are available for our youth choir at the Welcome Center. For more information contact Amy Peterson Derrick at 651.426.2369 or dre@wbuuc.org.